The plan seems to be to find something on Manafort and flip him to say something against Trump in order to avoid time. Hence the fishing expedition and reports that they were looking at potential financial crimes outside the proper scope of the Russia collusion investigation. FBI agents raided the Virginia home of Paul Manafort, President Trump’s former campaign chairman in late July, taking documents and other materials related to the investigation into Russia’s meddling in the 2016 election, The Washington Post reported. 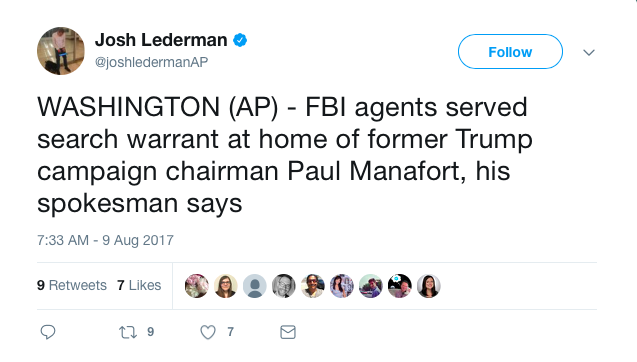 Armed with a search warrant, federal agents went to Manafort’s Alexandria home during the predawn hours of July 26 – one day after he met voluntarily with members of the Senate Intelligence Committee.